The 2009-10 NBA season is now more than one quarter of the way complete. I give the Jazz a B-minus for their performance thus far. Utah is 16-11, good for 2nd in the Midwest division and tied with Houston for 5th in the Western Conference. If you take the glass-is-half-full perspective, you can point to the rash of injuries the team faced as a legitimate reason they don’t have a better record. You can also bring up their 3-0 record against the Spurs, and other marquee wins against the Blazers, Lakers, and Magic as cause for optimism, proving the Jazz can beat the NBA’s elite (at least at home). On the other side of the coin, you can point to complete meltdowns in the 4th quarter of close games against good teams (Lakers, Rockets, Nuggets, Mavs). Then there are the two inexplicable losses to the inept Minnesota Timeberwolves. Speaking of, how in the world do the Jazz beat the Lakers and the Magic (2 of the 3 best teams in the league) in consecutive outings and then turn around and lose at home to the T-Wolves (the 2nd-worst team in the league) the very next game? As of that December 14th loss to Minnesota in Utah, half of the T-Wolves 4 victories had come against the Jazz. The silver lining here is that the Jazz only have one additional loss to a sub-500 team (Sacramento), and the Kings are actually surprisingly respectable with a 12-14 record. 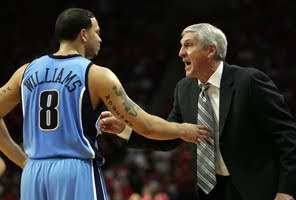 - Deron Williams - DWill is playing great and has looked like a true superstar at times. It will be a true crime if he doesn't get his first all-star bid this season. - Carlos Boozer – Booz has returned to his all-star form, has remained healthy, and is playing better defense than in previous seasons. - Kosta Koufos – I really expected him to have a breakout year, and he hasn’t even been able to get off the bench. - Ronnie Brewer – He hasn’t played poorly, but his production is down over last season despite playing more minutes. I was hoping for further improvement, but he may have already peaked. - Wesley Matthews – He may not have even made the roster had Korver and Miles not gotten injured in the preseason, yet he managed to win the starting SG position and has been hailed as the best defender on the team. - Eric Maynor – I made no bones about my disappointment with Utah’s draft selection, but Maynor has shown solid potential and plays with poise beyond his years. - Minutes - How will Sloan integrate CJ Miles and Kyle Korver back into the lineup now that they are healthy? Will a full roster actually hurt the team since there will be fewer minutes to go around? - Trades – Will the Jazz make a move before the February trade deadline? Should they? I’ll speculate/opine on that in my next update.